Lancôme will launch La Vie Est Belle Eau de Parfum Intense in August. 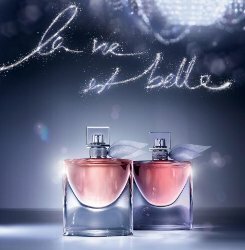 The new fragrance for women is a deeper, more gourmand variation on 2012's La Vie Est Belle Eau de Parfum, as was last year's La Vie Est Belle L'Absolu (and see also: La Vie Est Belle L’Eau de Parfum Légère, La Vie Est Belle Eau de Toilette). La Vie Est Belle Eau de Parfum Intense was developed by perfumers Dominique Ropion and Anne Flipo. The notes include bergamot, orange, pear, blackcurrant bud, pink pepper, iris pallida, tuberose, ylang ylang, jasmine, orange blossom, and a nut accord. Lancôme La Vie Est Belle Eau de Parfum Intense will be available in 30, 50 and 75 ml. A more gourmand version? La Vie Intense? Yay. Instead of saying 30 ft from the Lancome counter..now I won’t even be able to go into the store without being hit by the La Vie cloud. Thanks Lancome! Lol…I feel the same. Another Angel knockoff, now even stronger. Yay! Apparently it was the best selling fragrance in France last year…we’ll probably get more of them. The original gives me a headache. Somehow, (luckily,) I missed the L’Absolu. I can only hope to steer clear of this one. Not only flankers, repetitive flankers. If this is an intense, what’s an Absolu??? I was going to say this may be the kind of modification that went into the Angel Absolue version or the Ellie Saab Intense. Both are deeper than the originals and the ESI is also a bit quieter. Where is this? I want to test it. I wish they had kept the silver heavy cap :(.